These extreme weather events carry substantial economic costs. In the updated data (Figure 3; Figure 2 in 2018 updated publication), thunderstorm losses in North America have doubled – from under US$10 billion in 1980 to almost $20 billion in 2015. On a more positive note, river flood losses in Europe show a near-static trend (despite their increased frequency), indicating that protection measures that have been implemented may have stemmed flood losses. 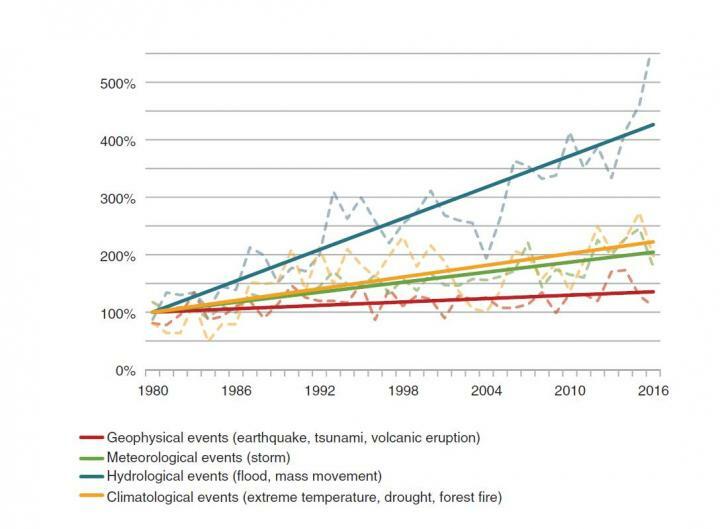 Professor Michael Norton, EASAC's Environment Programme Director states, "Our 2013 Extreme Weather Events report – which was based on the findings of the Norwegian Academy of Science and Letters and the Norwegian Meteorological Institute – has been updated and the latest data supports our original conclusions: there has been and continues to be a significant increase in the frequency of extreme weather events, making climate proofing all the more urgent. Adaptation and mitigation must remain the cornerstones of tackling climate change. This update is most timely since the European Commission is due to release its evaluation of its climate strategy this year."